The Internet Asks: Why Is It Called 'Grapefruit' When There Are No Grapes? In the internet age, the answer to most questions is just a web search away. Some queries, however, are too ponderous or inane to even be Bing-worthy. When all else fails, The Internet Asks responds. 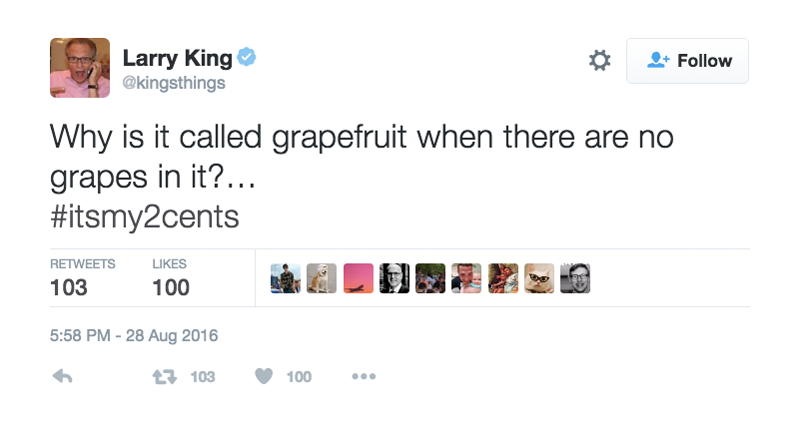 Having apparently exhausted his Seinfeld DVD collection, CNN host Larry King turned to Twitter Sunday night to answer a question that has plagued philosophers for millennia: Why are grapefruit—which contain absolutely no grapes—called “grapefruit”? The answer, it turns, out is simple. On the tree, grapefruit happen to look a lot like grapes. Another horticultural magazine gravely informs its readers that the grape-fruit (Citnis decumana) receives its common name from the fact that it grows ‘in grapose clusters.’ Everybody that has seen the grape-fruit growing knows that the fruits hang singly, like their near relatives the orange and lemon. ‘Grapose clusters’ savors strongly of facts manufactured to fit the explanation. Some time ago, the editor took occasion to criticise the statement made in a horticultural journal that the grape-fruit gets its name from being borne in “grapose clusters,” whereupon a subscriber wrote to say that a grape-fruit does grow in clusters, and that this point is the distinguishing point between a shaddock and a grape-fruit. We do not contend, however, that there never are several grape-fruits near each other on a branch, but that they do not grow in clusters like grapes. For some people, it seems, no explanation is too obvious to contradict.